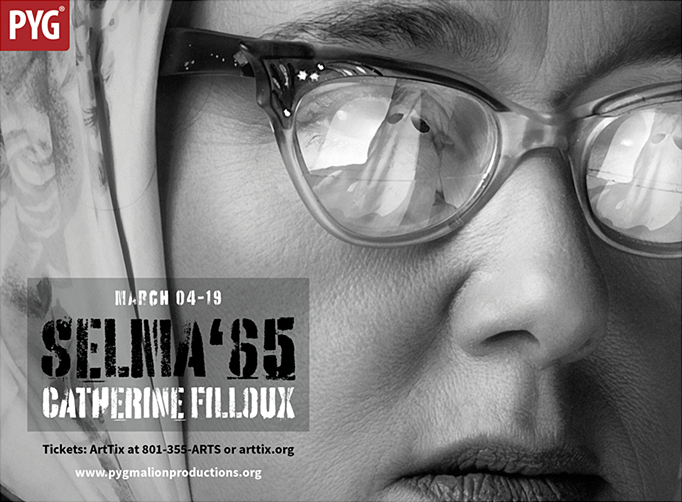 In rememberance of the 50th anniversary of the Selma Voting March, award-winning playwright Catherine Filloux brings to life the interconnected stories of Viola Liuzzo, white civil rights activist, and Tommy Rowe, FBI informant, undercover with the Ku Klux Klan. Meet our friends from the NAACP Salt Lake Branch before the show and learn more about this vital organization during a short presentation following the performance. The National Association for the Advancement of Colored People (NAACP) Salt Lake Branch was formed in 1919 to combat discrimination in local schools. Nationally, the NAACP works to ensure the political, educational, social, and economic equality and rights of all persons and to eliminate race-based discrimination. Join us for a conversation with Selma ’65 playwright Catherine Filloux and author of The Informant Gary May. We’ll dive deeper into the history of Viola Liuzzo and Tommy Rowe, investigating how their stories converged during the historic Selma Voting Rights March. Meet our friends from the ACLU of Utah before the show and learn more about this vital organization during a short presentation following the performance. The ACLU of Utah operates through public education, legal advocacy, litigation, and lobbying to ensure the constitutional rights and freedoms of everyone living in or visiting Utah. Tracie is a transplant from back east who is grateful to have found a home in the SLC theatre community. Previous PYG credits include Cheat and Stop Kiss. Other favorite local and regional works include: Rapture, Blister, Burn and Ice Glen at SLAC; Rings at The Grand Theatre; Lady Macbeth, Di Esperienza and SLAM at Plan B; Dracula at PTC; Rare Bird at the U; The Rainmaker at Hale; Metamorphoses, To Kill a Mockingbirdand As You Like It at the Clarence Brown Theatre; La Bete and The Tempest at Theater at Monmouth; and three Shakespeare tours. A member of AEA, she received her MFA from UT-Knoxville and a classical degree from Weber Douglas Academy in London. Tracie also takes great pride in being involved in readings to develop new plays (call me!). Thank you Lane and Pygmalion for this incredible opportunity. Endless love to Scott, both of their families, and huge thanks to her Dad for hours spent running lines. Lane has been in the Salt Lake theatre scene for nearly 20 years. He has worked with Pygmalion, Salt Lake Acting Company, Plan B, The Grand, Wasatch Theatre Company, Sundance Children’s Theatre, Pinnacle Acting Company, and many others. Currently, Lane sits on the Board of 3 companies; Salt City Radio Players, of which he is also the founder, Silver Summit Theatre Company, and Pygmalion Theatre Company. With Pygmalion, Lane has directed Hellman v. McCarthy, A Night with the Family with Laurie Mecham, The Mysterious, Happy Life of Brown Bag, and Seven, which was nominated for a City Weekly Arty for Best Production. He has also performed in numerous shows with Pygmalion. Last spring, Lane had the honor to direct a reading of Concessions, by Brian Richard Mori, at Abingdon Theatre in New York City. He also recently directed Greater Tuna in the heart of Central Texas, at Vive Les Arts Theatre, in Killeen. From 2008 – 2010, Lane was the Artistic Director of Utah Theatre Artists Company, where he directed Burn This, The Turn of the Screw, I Ought To Be In Pictures, 2 Across, and others. Other favorite directing credits include Buried Child (Silver Summit Theatre), Chapter Two (Wasatch Theatre Company), The Sunshine Boys (Pinnacle Acting Company), and numerous live radio theatre pieces, as part of Salt City Radio Players and Utah Theatre Artists Company. Lane’s project following Selma ’65 is a tour of the live radio theatre production of The Thin Man, by Dashiell Hammett with Salt Lake City Radio Players. Much love and mad thanks to Tracie and Catherine. Jennie is pleased to return to this position with PYGmalion Theater Company. She recently stage managed Wit (Wasatch Theatre Company), Hellman v. McCarthy (PYGmalion) and Motherhood Out Loud (PYGmalion Theater Company) and has absolutely enjoyed the experience. She would like to thank her family for all the love and support. Currently the Production Stage Manager and Technical Director for Repertory Dance Theatre, Pilar graduated from the University of Utah in 2003 and has worked the last 20 years across the Wasatch Front in virtually every venue and with every arts organization. Pilar is excited to be returning to PYGmalion Theater Company, having previously designed over a dozen productions with the company. Pilar is a Journeyman Member of IATSE-Local 99.